Although we work with Alicante Bouschet nearly every vintage, it’s been a long nine years since we last bottled one on its own. 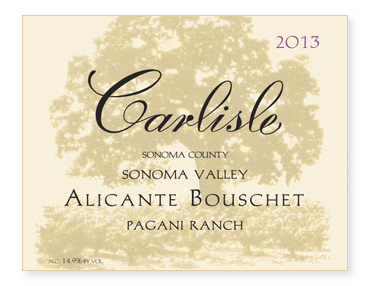 But there was no denying the quality of our 2013 Alicante, courtesy of the 93-year-old vines at Pagani Ranch. The wine was simply too good to fully blend away. One of our last lots of the year, the fruit was fully destemmed and cold-soaked for five days before inoculation with a German isolate of yeast called Assmanhausen. (I’m sure you can guess what we call this yeast in the winery. Cosmo Kramer would be proud! ;-) After 24 days on the skins the wine was pressed to mostly older, neutral barrels and bottled unfined and unfiltered 16 months later.